James told his teammate how to improve his play in the Lakers' loss to New York on Sunday (March 17). During the Los Angeles Lakers' latest loss on Sunday afternoon (March 17), multiple observations were made with regard to LeBron James. Just like most games he's part of, King James brings the spotlight with him as he's constantly scrutinized for everything he does or doesn't do. It seems LeBron James is sending his message to free agents to become part of the team, as his body language and verbal communication with teammates on Sunday showed apparent frustration. In a video clip posted to Instagram, LeBron James seems upset with a teammate for his inability to finish a play. 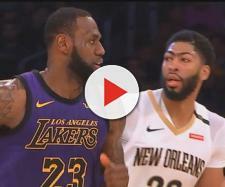 During the clip, James swears at the unidentified teammate saying "Dunk that mother******," in what appears to be part frustration and part of him trying to teach some wisdom to a younger player. Check out the video footage below for the NSFW comment James directs while on the bench. Only the back of his teammate's head appears in the video, but it could be rookie Johnathan Williams from Gonzaga. Williams finished the game with 12 points on 5-of-7 shooting in his 25 minutes off the bench. The Lakers' rookie also grabbed seven boards in the loss. 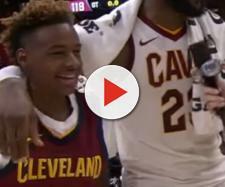 That said, LeBron appeared to be giving a stern teaching moment to the youngster. Whether or not the Lakers make some moves this summer including a big trade, remains to be seen, but would a player like Johnathan Williams become a player LeBron wants on the roster? It probably depends a lot on who the King sees potential in when he talks to the powers that be. If that's not enough to raise eyebrows, there's more. A lot of fans are celebrating the fact that Mario Hezonja blocked LeBron on the final play of the game, securing a Knicks' comeback win at the buzzer. However, the other thing that's getting some attention, is LeBron's bench position during a huddle. The superstar appears to have no interest in being part of the team huddle. A video clip from the game shows LeBron seated far away from other team members during a timeout. The fact he wasn't showing "leadership" truly bothered former Knicks great Clyde Frazier, who is now part of the commentary team in New York. Basically, Frazier played in the old school days of basketball, where team leaders showed "togetherness" even when times were tough. From the way it looked here, LeBron was not showing that same sort of leadership. Frazier may have had a point there, although LeBron James may simply feel the team is a lost cause and that Luke Walton's plays aren't worth listening to. It's not the first time LeBron yelled at a Lakers teammate in frustration during a loss, either. Most likely, when this summer arrives, Walton will be replaced and some of those teammates LeBron is far away from will also be trimmed away from the roster. That said, does Clyde Frazier have a point in terms of LeBron needing to show better leadership with the current situation?